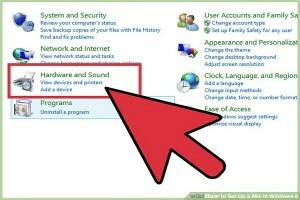 You can access the microphone menu from the start menu, taskbar, and control panel of your Windows 8 computer. Here all three methods are given with simple steps. 1. Hit ‘Windows’ key on your keyboard. 2. Type ‘microphone’ in the search bar. 3. Select ‘Settings’ from the results. 4. In the settings window, click on ‘Manage audio devices’ option. 5. Open ‘Recording’ tab in the sound window. Here you’ll see your microphones. 1. Right click on the ‘ Speaker’ icon at the left side of the taskbar. 2. Click on ‘Recording devices’ on the prompted menu. A list will open with your microphones devices. 1. Take your mouse cursor to the top-right side of your screen. 3. Click on ‘Control Panel’ in the next menu. 4. You’ll see the control panel window on your screen. 5. Click on ‘Hardware and Sound’ settings. 7. The sound window will open on the screen. 8. Open ‘Recording’ tab in the sound window. To disable, change, or set as default, you need to open the recording tab in sound windows. With any of the above method, open microphone settings. 1. Locate to the ‘Recording’ tab under the sound window. 2. Look for the microphone you want to use or modify settings. 3. Right click on a microphone to use it. 4. Click on ‘Set Default’ option. 5. Choose ‘Set as default device’ to activate the microphone, and use it on your computer. 6. Or, choose ‘Set as communication device’ to use the microphone only for communication programs, chats, and games. • Check that your microphone is plugged in. • Check the jack in which the microphone’s plug is inserted. • Check ‘Show Disabled Devices’ option is turned on. Right-click on a microphone and checkmark ‘Show Disabled Devices’ to view disabled devices. • Locate to the ‘Recording’ tab under the sound window. • Tap on the active microphone or say something. • Check the rising green bars next to the active microphone name. • The green bar will rise when you create sound. If you’re not seeing any green bar for the microphone you’re using, configure it. Before configuring the microphone once check it is set as default or not. 1. Click twice on the mic to open its properties. 2. Switch to the ‘Levels’ tab from the above tabs menu. 4. Click and hold the slider button of microphone slider. 5. And drag it to the far right of the slider to the 100 points. 6. Then click ‘OK’ to go back to the sound window. That’s it! Now, create sound, tap on the microphone, speak something and check the green bars.